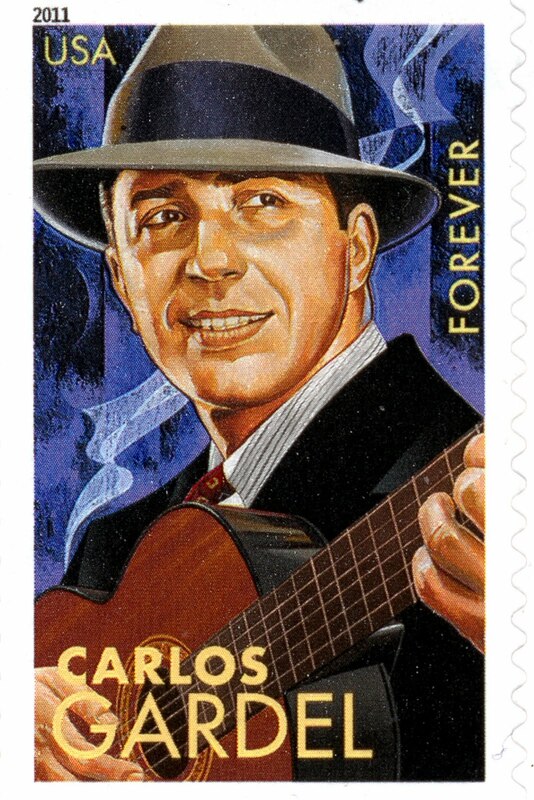 Yesterday, when I went to the post office to mail copies of Moon Handbooks Argentina and Moon Handbooks Buenos Aires to the winners of my recent contest, I also asked to purchase some stamps and was pleasantly surprised to find a commemorative sheet of “Latin Music Legends.” It included three US citizens (Tito Puente, Cuban-born Celia Cruz and the Texan Selena Quintanilla), but also two non-citizens: the flamboyant Brazilian samba singer Carmen Miranda and the suave Argentine tango master Carlos Gardel. San Diego artist Rafael López did the illustrations for the series. Miranda, in fact, was a star in Hollywood, where she made more than a dozen films and became known for her outrageous fruit-covered hats - there’s even a Carmen Miranda Square at Hollywood Boulevard and Orange, across from the landmark Grauman’s Chinese Theater. Gardel’s stateside credentials, though, came more from his singing and his work in Spanish-language cinema in New York - while he went to Hollywood, his poor English-language skills prevented his crossing over in the way that Miranda managed. While he might have managed to improve, his 1936 death, at the age of 44 in a plane crash in Medellín, Colombia, ended any such hopes. The preposterous project to limit bicycles to designated trails is dead. 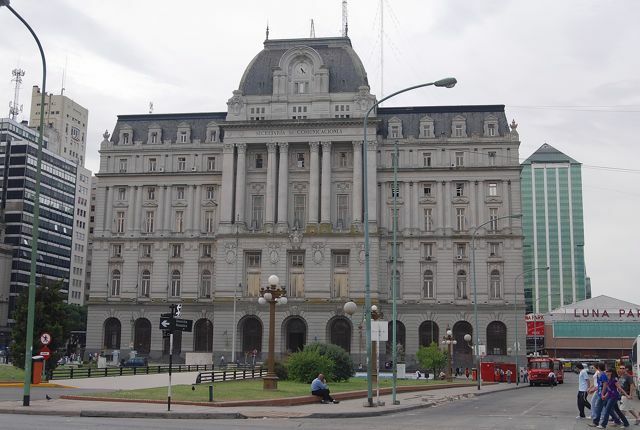 According to the online Santiago Times, the 12 UDI legislators who originally introduced the bill backed off in the face of vociferous opposition from cycling groups and others - not to mention the fact, as voiced by La Bicicleta Verde’s Mac Mitchell, that “The police don’t have the inclination or the time to enforce something like that.” In fact, if traffic safety is the issue, it would make more sense to tackle distracted drivers on cell phones than cyclists (unless, of course, those cyclists are also on cell phones). In fact, the last leg of my journey through post-earthquake Chile took me farther from the epicenter, but not so far that the damage was not palpable. At the town of Curepto, for instance, virtually the entire parish church was covered with corrugated aluminum as it awaits repair, and many buildings were framed with two by fours and other supports to keep them from collapsing. After leaving Talca, my first overnight was at the British-run Hacienda Laguna Torca near its namesake national park, a lush coastal wetland that’s home to 2,000 black-necked swans. Just inland from the town of Llico, a prime windsurfing site that got hit by the tsunami but is recovering nicely, the Hacienda suffered no serious earthquake damage, but an invasion of salt water affected its olive groves. With time and rain, fresh water is recharging the aquifer. To the north, thanks to broad sandy beaches and the left break at Punta de Lobos, the town of Pichilemu is one of central Chile’s top seaside resorts and prime surf spots, but that also made it vulnerable to the tsunami. According to Marcel Janssen, the Dutch owner of the Pichilemu Surf Hostal, the tsunami rolled right past the bar (across the street), but the quake itself damaged the walls; it’s since been upgraded into a more stylish beachfront bar, with a deck and heated saltwater tubs for relaxation. In and around Santa Cruz, though, the devastation was such that, at the time, the irrigation canals in some vineyards literally ran red - with wine. 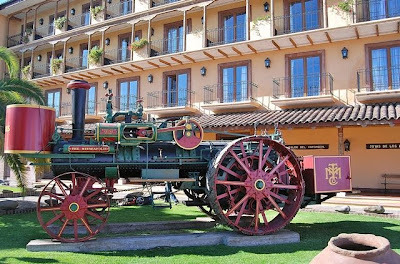 Where the 19th-century parish church stood facing Santa Cruz’s Plaza de Armas, there is now a vacant lot, and many other buildings are still in ruins, even if the remarkable Museo de Colchagua and its adjacent Hotel Santa Cruz Plaza have quickly recovered - the controversial Carlos Cardoén has poured money into the city, but he can’t do everything. Some of the surrounding communities suffered serious devastation. 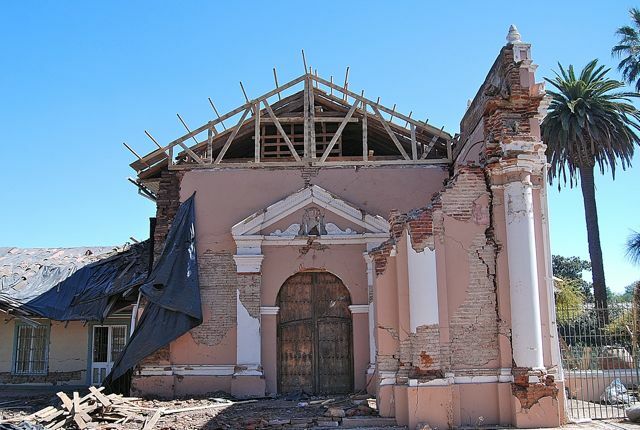 At nearby Huique, the quake flattened parts of the historic residence of former president Federico Errázuriz Echaurren and knocked over the tower of its adjacent chapel. Other parts of the complex, already in neglect after passing into the hands of a peasant cooperative, are virtually beyond repair. 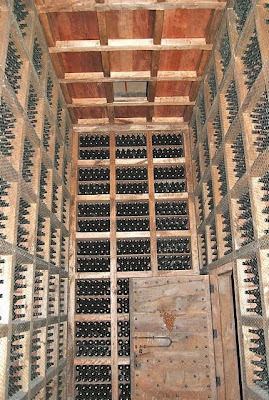 At Apalta’s Bodega Neyen, where I took a tour, several hundreds bottles of premium wine fell off the shelves and shattered on the concrete floor below, but nobody was injured. 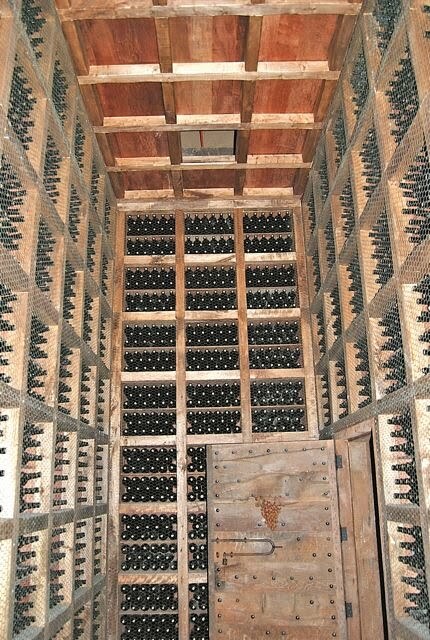 The remaining stock is now protected by chicken wire that prevents it from falling. 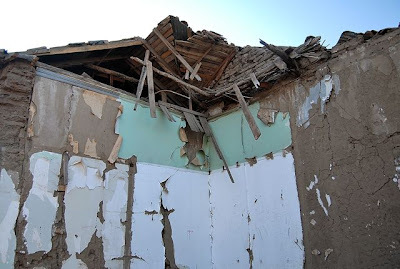 Probably the most seriously affected was the picturesque village of Lolol, where virtually every adobe sustained severe damage and many of them still bear warning tape and spray paint tags that say “danger, total collapse.” The church is still standing, but fenced off and services now take place in an adjacent tent. That said, the region is on the road to recovery. Amongst the devastation, Cardoén’s Museo Artesanía Lolol is an exceptional crafts museum that’s well worth a detour from Santa Cruz, and most of the wineries on the Ruta del Vino de Colchagua (whose offices appear in the photo at top) are once again open for tours and tasting. 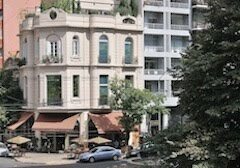 When I passed through Santa Cruz, Cardoén’s hotel was booked solid, but I managed a couple nights at the Hotel Terraviña, operated by Danish journalist Anne Sorensen and her Chilean husband. 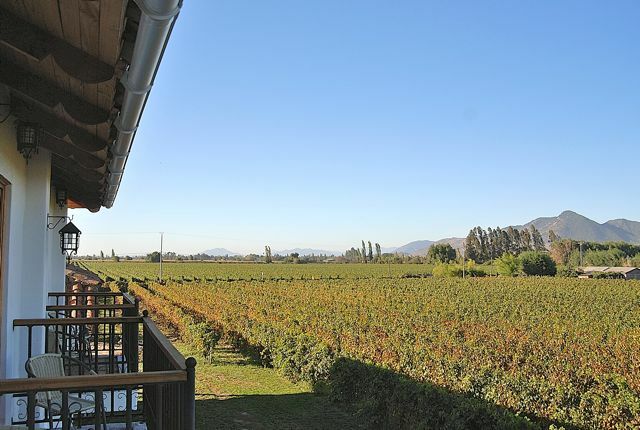 Surrounded by its own vineyard (once part of the nearby Laura Hartwig winery, which is newly open for tours), the Terraviña opened shortly before the quake and, in its aftermath, found itself part of the relief efforts. Government officials and business travelers helped get it through the first year but, as tourist traffic has recovered, it’s become a hotel again. One of its attractions is that, though it has no restaurant of its own, two of Santa Cruz’s best - the Italian Vino Bello and the Peruvian La Casita de Barreales - are only a short stroll away through the vines. In Honor of Gabriela; Chile Criminalizes Cycling? Shortly before leaving Santiago, I paid a visit to the new Centro Cultural Gabriela Mistral, in what was formerly known as the Edificio Diego Portales. Recently renamed for the Nobel Prize poetess, it’s a controversial building because, after the military coup of September 1973 deposed President Salvador Allende and severely damaged the La Moneda presidential palace, General Augusto Pinochet’s governing junta set up shop in the utilitarian box until the Moneda’s restoration in 1981. Originally built for a United Nations conference in 1972, the Portales itself suffered serious damage in a 2006 fire that destroyed about 40 percent of the structure. 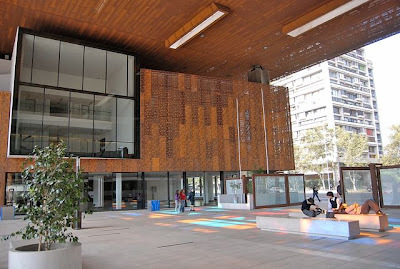 While it will never be an architectural charmer - most Santiaguinos appear to deplore the boxiness that makes it resemble a copper-colored Wal-Mart - it’s undergone a major interior transformation that includes several galleries and theater spaces, and a restaurant with a sunken patio away from the noisy nearby Alameda, the city’s main thoroughfare. 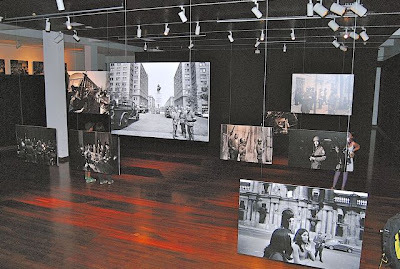 Certainly, as the junta occupied the Portales for eight years, neither they nor any other Chileans could ever have imagined the photographic display that’s here until the end of the month: an extensive exhibit, in stark black and white, of the work by Dutch photographer Koen Wessing (who died in February) of the days immediately following the 1973 coup. 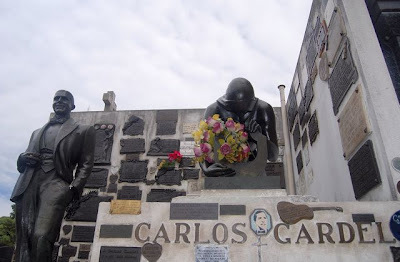 It includes scenes from Ñuñoa’s Estadio Nacional, where many prisoners perished, and even book-burnings. Those of you unable to visit in person can see part of the exhibit online here. One of the most preposterous proposals I’ve ever heard has just come out of the Chilean Congress: a law to ban bicycles except on designated bicycle lanes. The details aren’t yet clear but, on the face of it, it would appear to criminalize non-motorized two-wheel transportation even on roads like Aisén’s Carretera Austral, which has very little traffic on any kind. Bicycle touring might become illegal, even through the scenic southern lakes region, and companies such as Santiago’s La Bicicleta Verde, which offers bicycle tours of the city, would have to close down unless, of course, authorities create sufficient bicycle lanes to accommodate the capital’s roughly 600,000 active cyclists. At present, there are 250 km of bike paths for a city of six million residents. The rationale behind the measure, which comes from the right-of-center UDI party, purports to be traffic safety, but statistics suggest that cyclists are involved in only 0.19 percent of traffic accidents, while pedestrians are involved in 7.3 percent of them. 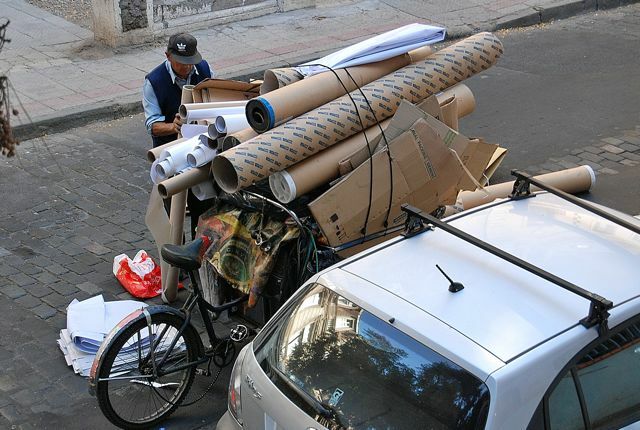 Bicycle advocacy organizations, such as Bicicultura and the Movimiento de Ciclistas Furiosos, have harshly criticized the proposal. It would also threaten the livelihoods of many in the informal employment sector, such as the cardboard recycler pictured here. The UDI appears to have retreated from its earlier stance, suggesting that the measure would be contingent on construction of another 1,000 km of bikeways over the next decade, but this would be an infinitesimal percentage compared to the abundance of roadways for motorized vehicles. It would make more sense to widen highway shoulders throughout the country for the benefit of both cyclists and pedestrians. For more than two decades, the Argentine port of Ushuaia has been the gateway for tourist travel to Antarctica, and for good reason. 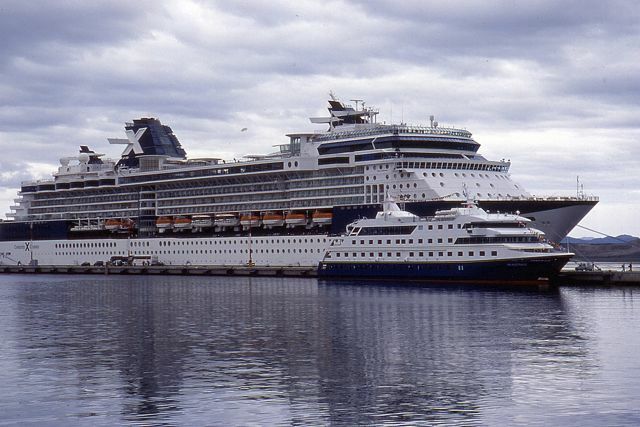 Not only is it the closest city to the Antarctic, but it also has an excellent international airport, good cruise ship facilities (pictured below), and other infrastructure, including accommodations, restaurants and shops. In fact, according to the municipal Secretaría de Turismo, Ushuaia has 144 separate accommodations, ranging from hostels to B&Bs to five-star hotels and everything in between, with over 2000 rooms and 5000 beds. 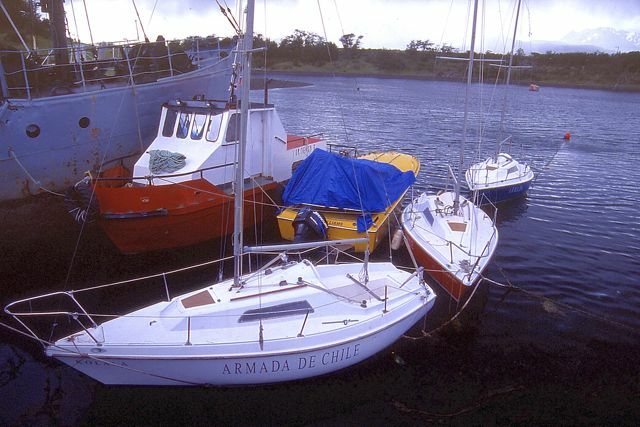 The nearest city with the infrastructure to compete with Ushuaia is the Chilean port of Punta Arenas, but it has one fatal disadvantage - sailing from Punta Arenas adds at least one costly day in each direction to any Antarctic voyage. Acknowledging that Punta is not a suitable gateway to the Antarctic, Chilean authorities have decided to expand the pier at tiny Puerto Williams - across the Beagle Channel, on Isla Navarino just 25 nautical miles southeast of Ushuaia - in hopes of attracting Antarctic cruise vessels there. 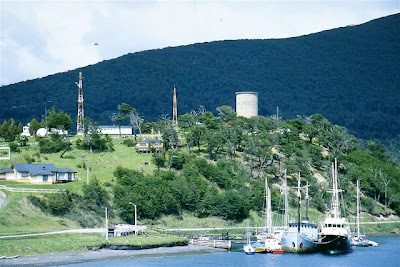 The problem, as I see it, is that without massive additional investment in Puerto Williams (pictured above, population about 2,000), including an airport expansion and major hotel construction, Ushuaia (population 56,500) has a head start that will be impossible to overcome in the lifetime of anyone reading this article. At present, Williams has only a handful of accommodations, and only one of those, the 24-room Hotel Lakutaia, is up to international standards. In total, there are probably fewer than 100 rooms on the entire island, in an area of nearly 2,500 square kilometers (about 1,000 square miles). Navarino has plenty of attractions, to be sure, but they’re not the sorts of attractions likely to grab cruise ship visitors - a trek through Williams’s wild southern beech forests to the tops of its barren crags - the Dientes de Navarino - is likelier to pull in rugged backpackers prepared for several days of the worst that this wet, windy capricious climate can offer. Providing the services that cruise ships visitors need will mean not just extending the pier by 70 meters (presumably to handle ships larger than the imposing Chilean naval vessel pictured below) and expanding the airport. It would also mean providing services, such as hotels and restaurants, that cruise ship passengers demand while waiting for their ship to sail. That would also mean large-scale immigration, at least seasonally, housing all the necessary workers, and providing supplies in a food-deficit area. 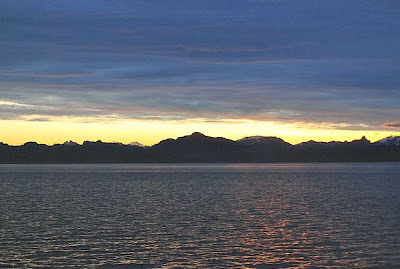 It’s worth noting that Puerto Williams is no longer even on a stop on the Cruceros Australis voyages from Punta Arenas to Ushuaia and back, as passengers on these cruises (which now go ashore at Cape Horn) clear customs and immigration at Puerto Navarino (far tinier than Puerto Williams), without even disembarking in Chilean territory. The crew simply carries the passports ashore at Navarino as the passengers are sleeping soundly on board. Over the past decade-plus, one of the most notable developments in Santiago’s dining scene (and to a lesser degree in the rest of Chile) has been the proliferation of Peruvian restaurants. In my opinion, Peru has the finest, most diverse cuisine on the entire South American continent, and Chileans have taken to it enthusiastically - much as North Americans have taken to Mexican food. Restaurants such as Providencia’s Astrid y Gastón and Barandiarán have set the pace for elite Peruvian dining, but there are many modest neighborhood places, such as Barrio Bellavista’s Pantaleón II, that serve outstanding food at everyday prices. There’s another less fortunate aspect to the Peruvian presence, and that’s the fact many undocumented Peruvians have poured into Chile - just as Mexicans have into the United States - because of economic hardship in their home country and opportunities across the border. In the process, they’ve sometimes become scapegoats among those who think Peruvians are taking their jobs away - though it hasn’t approached the flagrant and sometime violent xenophobia that Mexicans have suffered in US border states such as Arizona. Most Chileans I know welcome the Peruvian presence, though that may be skewed as they really like Peruvian food, but this year there’s an added twist because it’s a presidential election year - not in Chile, but in Peru. Last Sunday, in a result that Nobel Prize novelist and political commentator Mario Vargas Llosa has characterized as “a choice between AIDS and terminal cancer,” ultra-nationalist Ollanta Humala and Keiko Fujimori advanced to a runoff that will take place on June 5th. Vargas Llosa, who favored ex-president Alejandro Toledo, despises both Humala (who has ties to Venezuelan autocrat Hugo Chávez) and Fujimori (who has backtracked on pledges to grant amnesty to her father Alberto Fujimori, currently imprisoned for human rights abuses during his own presidency in the 1990s). Toledo ran a lackluster campaign and finished fourth, splitting the moderate vote with third-place finisher Pedro Pablo Kuczynski, his one-time economy minister. While Chile has refrained from interfering in its neighbor’s domestic politics, Humala has a history of vigorous criticism toward Santiago. His Peruvian supporters in Chile are making a blatantly demagogic appeal as the poster pictured here, featuring an allied congressional candidate, asserts that “Humala will protect you.” Though not overtly stated, the clear implication is that Peruvians need his protection from Chileans and their government. In Chile, meanwhile, Humala’s forces are trying to get out the vote with promises of low prices for consular services and remittances to Peru, and even “free legal, psychological and social advice” should their candidate prove victorious. 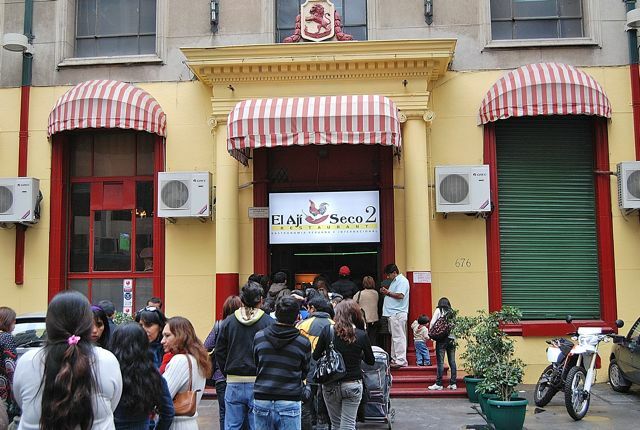 Meanwhile, every Sunday, Peruvians in downtown Santiago form long lines outside restaurants such as El Ají Seco to enjoy a taste of Lima and the Peruvian Andes - much as many Chileans do. I like to point out the fact that, in traveling from north to south or vice versa, most visitors to the Southern Cone countries don’t face the same jet lag issues that east-west international travelers do. Of course, that depends on the traveler’s starting point, but for those on the East Coast of the United States, for instance, the time difference is only an hour with either Buenos Aires or Santiago. Normally, there’s an hour’s difference between Buenos Aires and Santiago, which are in different time zones, but Chile goes on daylight savings while Argentina does not. Not so long ago, that started in mid-October and only went until mid-March, but this year President Sebastián Piñera’s government changed the date to April 2nd and, then, to May 7th. Daylight savings will start again on August 20th. The government’s principal rationale has been energy savings, though it’s not clear how much turning the lights on a little later will conserve, given that Chileans will have to turn them on earlier in the morning to go to work and/or get the kids off too school (here in Santiago, it’s still nearly dark at 8 a.m.). Other professed reasons have been public safety (extra daylight discourages crime) and the simple pleasure of evening daylight for those returning home from work. When the change finally occurs, the difference with the rest of the world will be one hour less (but there will then be an hour’s difference with Argentina), from the Peruvian border south to the Strait of Magellan (pictured above). Remote Rapa Nui (Easter Island), however, will continue to be two hours behind the mainland. 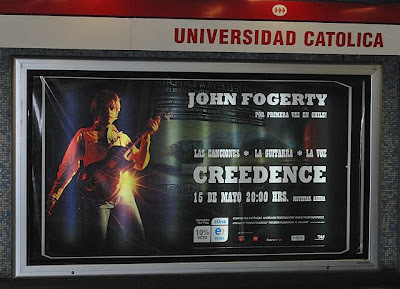 The first weekend of this month, in Santiago’s sprawling Parque O’Higgins, an all-star lineup performed at the initial Chilean version of the Lollapalooza pop music festival. The festival brought plenty of money into the city, with nearly every available inexpensive bed occupied - according to Pablo Fernández of Barrio Brasil’s 120-bed Hostelling International facility, demand was so high that he had to raise prices to 12,000 pesos (about US$25) in dorm rooms (when I was here in November, the price was 9,000 pesos, less than US$20). Rates for private rooms rose correspondingly in a facility that usually only has about 40 or so guests. Even the new and little known CasAltura, a self-styled “boutique hostel” in a magnificently recycled downtown mansion, filled all of its 35 beds. There were some glitches, but the sunny autumn weekend cooperated beautifully and, by most accounts, the crowds were satisfied. 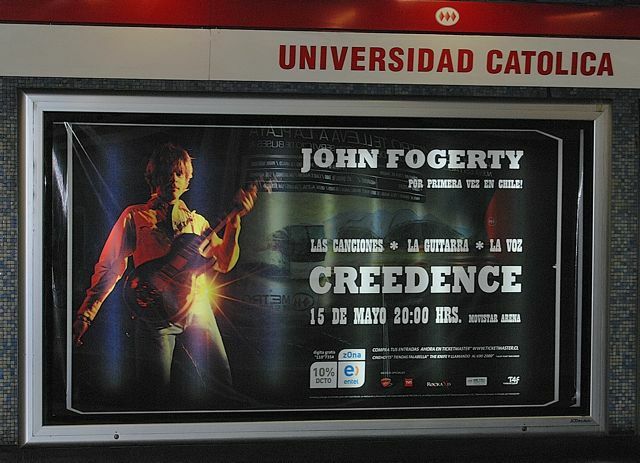 The second Chilean Lollapalooza will take place the first weekend of April in 2012. Given Chile’s thriving economy, Santiago has become an ever more popular destination for high-profile international artists. U2 played here recently and, over the next couple months, Paul McCartney (May 11), John Fogerty (May 15, the first time ever in Chile, though his former Creedence Clearwater bandmates have played the Viña del Mar festival), and even Miley Cyrus (May 4) will perform in the Chilean capital. 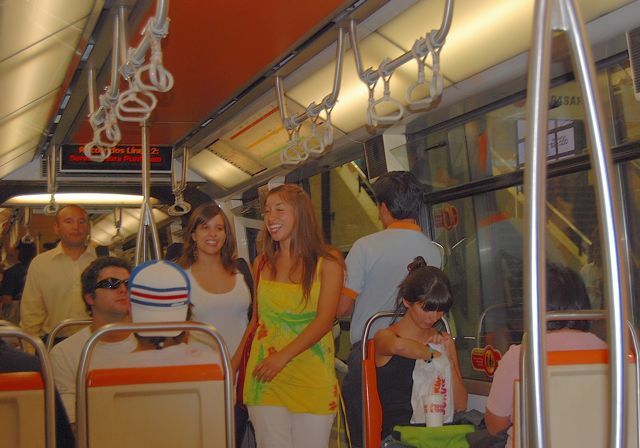 Today’s post discusses some comparisons between the Buenos Aires and Santiago subway systems, the two countries’ postal systems, and describes a proposed new link between continental Argentina and the Argentine side of the Isla Grande de Tierra del Fuego. 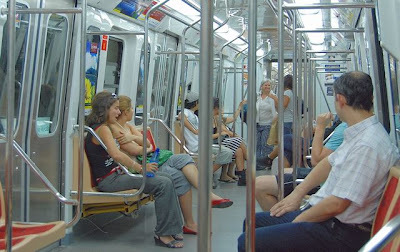 While Santiago’s Metro has long since surpassed Buenos Aires’s Subte in terms of its routes and service, the Argentine capital’s underground railroad has one distinctive advantage: except for its oldest cars (the wooden antiques on Línea A, which dates from 1914), it has placed all the seats against the cars’ outer walls, leaving wide aisles through which passengers can move relatively easily (the photo above shows the system at an especially quiet hour). It still gets crowded, of course, but that differs from the Santiago Metro (pictured below), where the few seats appear to be randomly placed with narrow aisles - so that there are often bottlenecks to get in and out of cars. This means everybody wants to be near the doors, which makes that part of every car so much more crowded. Out of curiosity, as I added value to my Metro electronic “BIP” card yesterday, I asked the station attendant what constituted tercera edad (senior citizen’s age) for purposes of discount tickets. She told me it was age 65 for men, but only age 60 for women - from my point of view, a clearly discriminatory policy on the part of Chilean law. Ever since the 1980s, when the Pinochet regime imposed the privatization of the state pension system, men have been expected to work five years longer than women. As I was preparing to send off the finishing touches of the manuscript for the upcoming third edition of Moon Handbooks Patagonia, I asked my Argentine collaborator Nicolás Kugler to send me his updated maps by courier to Puerto Varas, where I expected to be at the time. He did so but also emailed me PDF copies that I could work from - fortunately because, two days ago, they finally arrived, one month after he sent them. I could only conclude that Correo Argentino, the renationalized post office whose imposing Buenos Aires headquarters appears above, sent them by gaucho relay across the Pampas and over the Andes, as they arrived 11 days later in Santiago (about two hours by air from Buenos Aires). That said, it took another 20 days for them to arrive at my friend Andreas La Rosé’s Casa Azul B&B in Puerto Varas - having apparently spent most of that time in the Puerto Varas branch of Correos de Chile (the Chilean post office, which has never been privatized). My recommendation, for those who have to send urgent items internationally from either country, is to use a more reliable service such as FedEx. 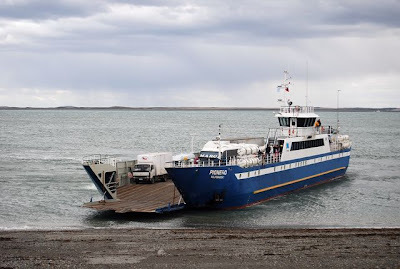 According to the online Santiago Times, the Argentine government intends to establish a maritime link (apparently a ferry) from Punta Loyola, east of the Santa Cruz province capital of Río Gallegos, to Tierra del Fuego’s northern shores. The six-hour voyage would enable Argentines to avoid traveling through Chile, an issue that gained notoriety in January, when Chilean protestors blocked highways into and out of the Magallanes region for a week because of an increase in natural gas prices. 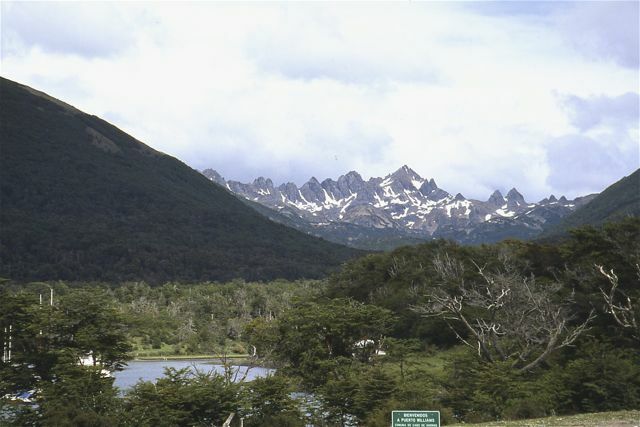 That left Argentine motorists and other overland travelers stranded on the Argentine side of the island. The Argentine government was correct in protesting the improper closure of an international border (though hypocritical in that it’s looked the other way even as ostensible environmental protests have closed the border between Entre Ríos province and neighboring Uruguay for more than four years). Where Chile has been more remiss, in the long term, is its failure to pave the roughly 125 km between the town of Cerro Sombrero and the border post of San Sebastián. That’s done more to slow down the traffic between the continent and the Argentine side of the island than a one-time protest that lasted only a few days. When that finally happens, I expect nearly all traffic to continue from Río Gallegos south through Chile to the Argentine side of the island - especially since any ferry from Punta Loyola would have to navigate the wild waters of the open South Atlantic. My guess is that any such service would suffer frequent postponements, and eventually be abandoned - even if the Chilean route also requires a (short) ferry crossing at Punta Delgada (pictured above), on the Strait of Magellan. 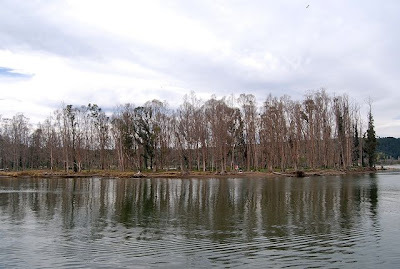 Among and around excursions to Talca’s stunning Andean backcountry, which I described in a recent post, I visited two of the cities most affected by the 2010 earthquake and subsequent tsunami: Talca itself, and the port of Constitución. Here, even more than in Concepción, the impact of the event is palpable, with vacant lots and damaged or destroyed landmarks, not to mention ordinary businesses and houses in a region whose traditional adobe architecture has been seismically vulnerable for centuries. In the course of my week-plus in the Maule region, I spoke extensively with Franz Schubert of Trekking Chile, who used his Casa Chueca guest house as an informal base for relief efforts; in fact, his guests chose to forego the rest of their vacations to chip in with assistance. I recorded my conversations with Franz, which also touch on several other topics, but it will be some weeks before I’ll have time to transcribe, edit and post them. 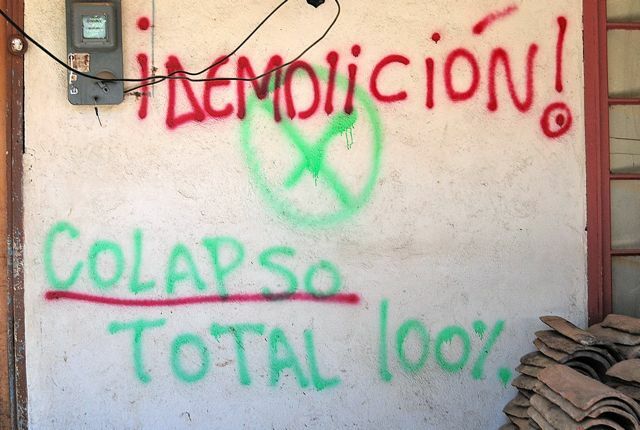 Talca itself suffered more than any other place of its size that I’ve seen - there are many vacant lots, and in some places only segments of old adobe walls stand, with rubble still to be removed (demolition and debris removal appear to be the growth industries here). 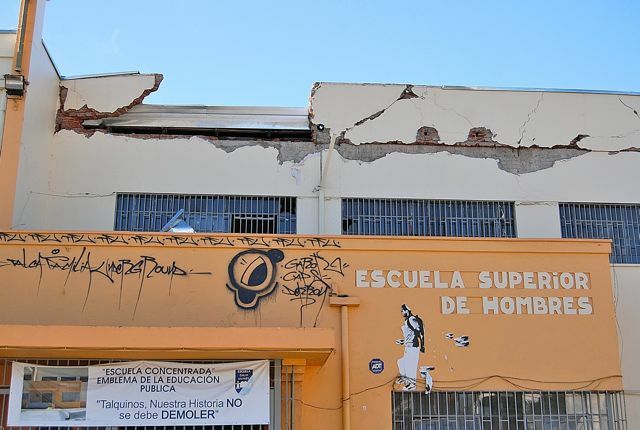 The landmark school near the new pedestrian mall, divided into separate wings for boys and girls, is due to come down; there is local sentiment to restore it, but it looks beyond repair - or at least beyond economic repair. On a visit to the regional Sernatur tourist office, I spoke with my longtime friend Verónica Morgado, whose rented B&B crumbled in the quake, but she and her husband managed to get all their guests out safely. They are building a replacement, which they expect to open for next season at year’s end. Verónica’s elderly mother was not so fortunate even if, in one sense, she was more fortunate. 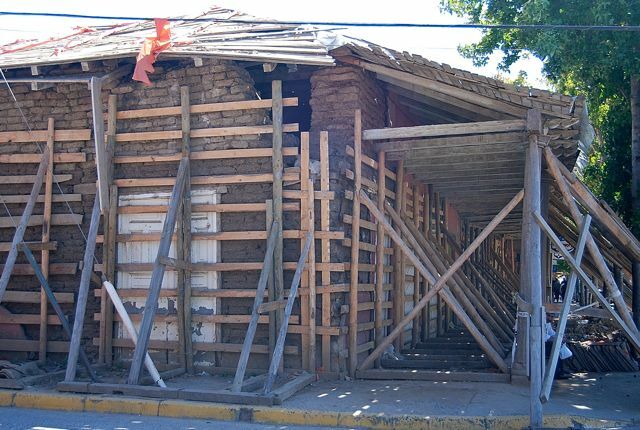 Out of town for the weekend, she avoided the collapse of her 19th-century adobe, but its psychological impact was even more powerful. She fell mute after the event and, failing to respond to therapy, died shortly thereafter. Obviously, this wasn’t a direct fatality, but the quake certainly appears to have been a contributing factor. 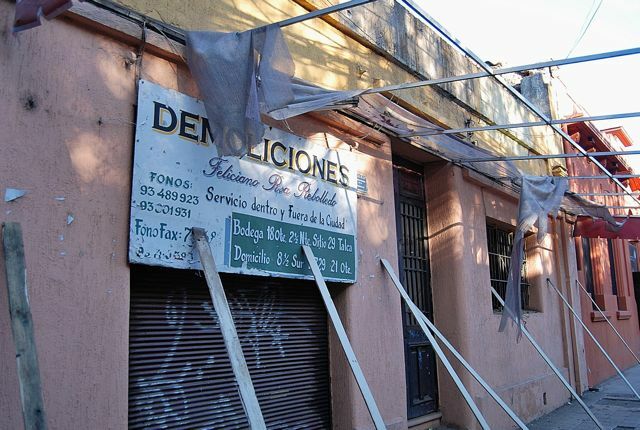 Still, Talca is rebuilding. 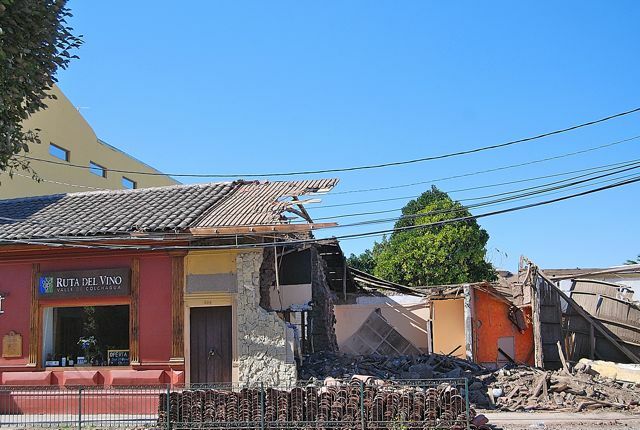 Its most hopeful precedent may be the city of Chillán, whose massive 1939 earthquake (8.3 on the Richter) left the city’s face transformed forever - like Talca, Chillán lost nearly all of its historic adobes, and had to rebuild almost from scratch. A year ago, though, it got through the quake with little damage, despite the greater magnitude and its own proximity to the epicenter. Constitución may have a longer road ahead. 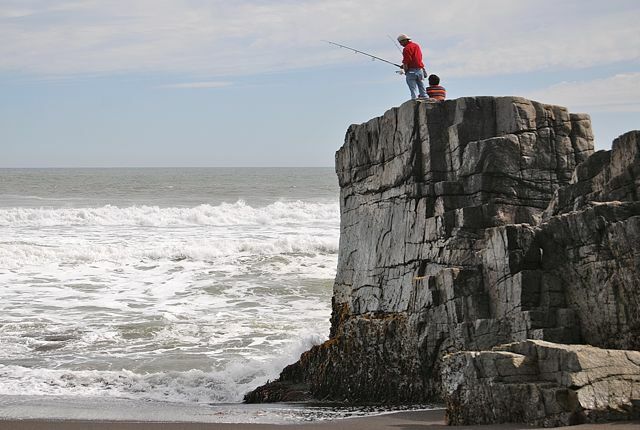 The port city, best known for its pulp plant, suffered a double hit. The quake flattened many of its older houses and toppled some of the walls of its landmark church, but here the human tragedy was even worse: as the tsunami worked its way up the Río Maule estuary, it swept away more than a hundred campers who were celebrating the end of summer on Isla Orrego, a small wooded island (pictured above). The waters even reached the Plaza de Armas but, astonishingly, spared the Hostería Constitución opposite the island. A few km south, at the port of Maguillines, the tsunami wiped out several large warehouses and perhaps a dozen seaside restaurants, a couple of which have rebuilt. The winding road there, though, shows what Constitución still has to offer. 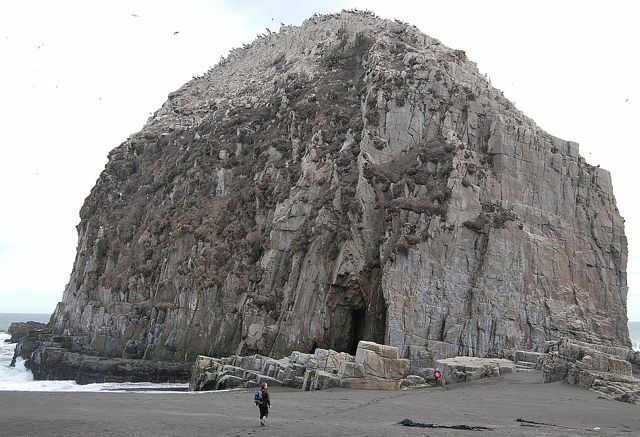 Spectacular igneous stacks have resisted the ocean’s erosive force and one of them, Piedra de la Iglesia (pictured above), is covered with nesting pelicans, gulls and cormorants plus, on its lower levels, southern sea lions basking in the sun. Just beyond road’s end, Playa Maguillines features other granite outcrops - some vertical pitches would offer challenging sport to adventurous free climbers - and outstanding perches for ocean fishermen. Every so often, I hear from readers who hope to travel by long distance train in Argentina and Chile. Reluctantly, I have to tell them that, with few exceptions, they don’t want to take trains in either country. 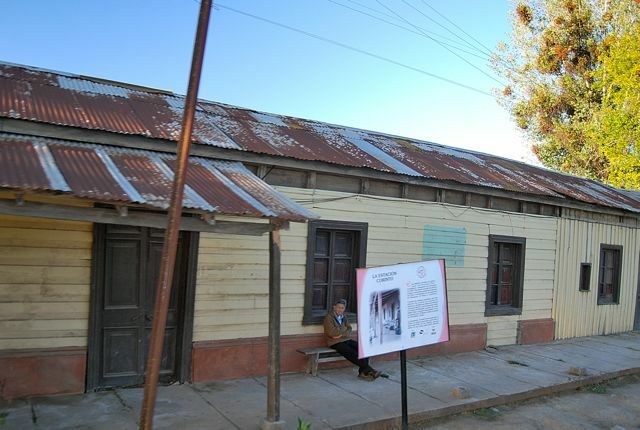 Those in Argentina are agonizingly slow, poorly maintained and serve few destinations, while those in Chile, especially since the February 2010 earthquake, reach only to Talca, about four hours south of Santiago. In both countries, buses serve many more destinations with greater frequency, are far more comfortable, and are reasonably priced. 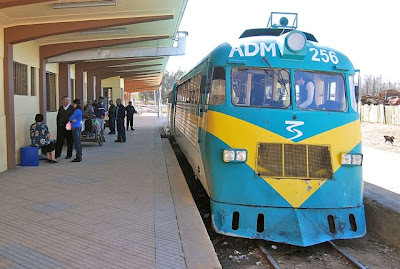 In Argentina, it’s probably the faux romance of Paul Theroux’s overrated opus The Old Patagonian Express that makes so many people want to travel by train there, but today’s La Trochita is only a short-line tourist train - fun for what it is, but it’s not transportation. In Chile, though, there is one train I highly recommend: the narrow gauge short-line that runs twice daily from the city of Talca to the coastal town of Constitución, a distance of only 88 km. This is not a tourist train, but it is entertaining. Oddly, the Ferrocarril Constitución is a two-car train whose locomotive (also the lead car) is a 1961-vintage FerroStaal railbus. Even more oddly, it operates on a route that mostly follows the north bank of the Río Maule; most of its stations (many of them such as Corinto, pictured below, sadly deteriorated) serve villages and whistlestops with no other public transportation, and few roads of any sort. 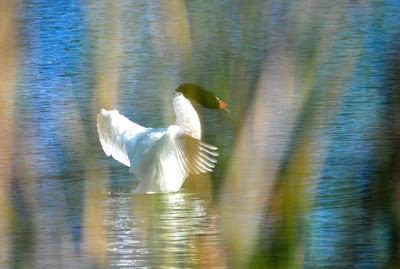 Just east of Constitución, it crosses the river to the south bank of broad Maule estuary. Most of its passengers are peasants with no other means of transport, and they often carry chickens and other farm animals; the main topics of conversation are grapes, melons and pastures. With no trucks or cars at many if not most stations, dogs here have no alternative but to chase the train. 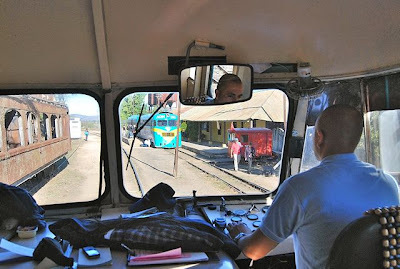 Last Sunday, I rode the Ferrocarril for the first time in ten years, in the company of three German tourists who were also returning from Constitución to Talca, but everybody else on board was a local; at a maximum speed of 40 km per hour, it took us more than three hours to cover the distance from the coast to the city. For that reason, I usually recommend taking the train one-way and returning by bus, which takes about half the time. We almost suffered an additional delay: as we approached Talca, a woman stalled her compact car at the edge of the tracks and, despite the train’s shrieking horn, she did nothing to get out of the way, nor even to flee the vehicle. Fortunately, the alert engineer managed to stop just inches short of contact; had we hit her, it probably have done nothing more than spin her vehicle around. After she finally managed to get the car off the track, she stepped out with a smiling wave to the engineer.